TriMet makes history next month with the extension of our Line 24-Fremont bus line. Starting Sunday, March 3, the route will continue from Legacy Emanuel Hospital in North Portland, across the Fremont Bridge to the Slabtown, Northwest, Alphabet and Goose Hollow neighborhoods. 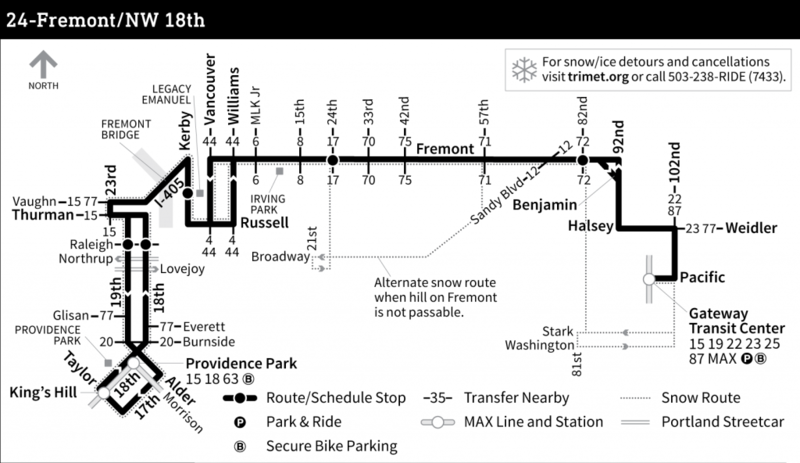 The new Line 24-Fremont/NW 18th will be TriMet’s first to cross the Fremont Bridge since the bridge opened in 1973. It will offer a quick, reliable link between Portland’s east and west sides, connecting with MAX Blue and Red lines at Providence Park in Southwest Portland. The new Line 24 route will shorten trips across the Willamette River and in some cases, eliminate a transfer between the Line 24 and other bus lines. It will provide a convenient link to MAX for trips to the Oregon Zoo, Beaverton and Hillsboro. It will also run more frequently, with additional trips throughout the day, expanded evening service hours and new Saturday and Sunday service. Just as Line 24 is bringing new mobility options to North, Northeast, Northwest and Southwest Portland, we are also improving service in Clackamas County. We’re adding a new bus line, Line 31-Webster Rd to serve Clackamas, Gladstone and Milwaukie. We’re also adjusting the route of Line 79-Clackamas/Oregon City for a more direct connection between Clackamas Town Center and Oregon City Transit Center. Riders can check trimet.org/planner to see if their trips will change. Be sure to change the date to March 3 or later to see updated schedule information. TriMet is continuing to expand service throughout the region under HB 2017, the Keep Oregon Moving law, as well as an incremental increase in the employer payroll tax, approved by TriMet’s Board of Directors in 2015. These improvements are part of TriMet’s 10-year plan to provide more and better bus service across our tri-county service district. The increases we’re rolling out this spring come on the heels of the largest-ever single bus service expansion in our history, and we’re already making plans for more. See what’s in store for fall 2019 and beyond at trimet.org/plan.